Winterfell White Bathroom Vanity - The Winterfell is built with ample storage space while still providing the classic elegance and beauty you seek for your comfort station. A white bathroom vanity adds function and classic style to any bath design from traditional to country or Victorian to modern. White bathroom cabinets are a prevalent choice for bathroom makeovers because they brighten up a space with clean lines. A white vanity works in any bath décor. The higher vanity cabinet heights reduce unnecessary back strain and provide easy comfort. 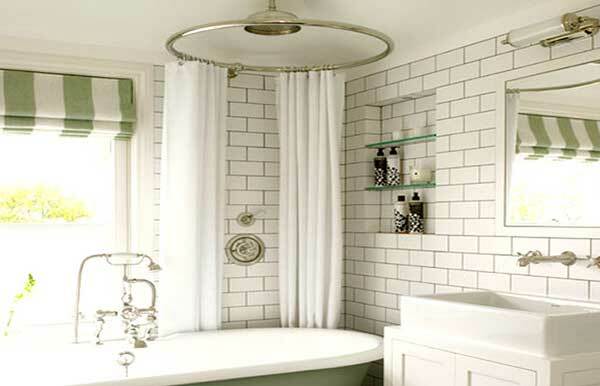 Add style to white bathrooms as the clean white finish creates a spa-like environment in any space. 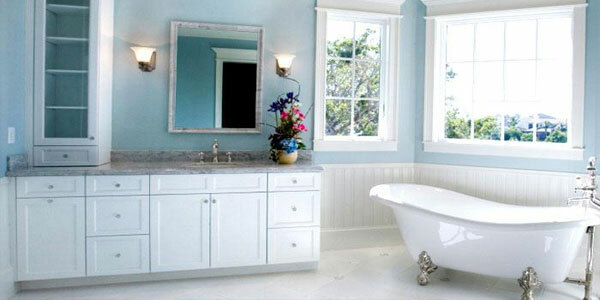 Vintage Blue and White Bathroom - Custom white bathroom vanity provides ample storage in this vintage bathroom design. Moreover, white bathroom cabinets look fabulous in small bathroom floorplans as they provide the allusion of space and cleanliness especially when complemented by sparkling chrome or polished nickel fittings, faucets, and towel bars. 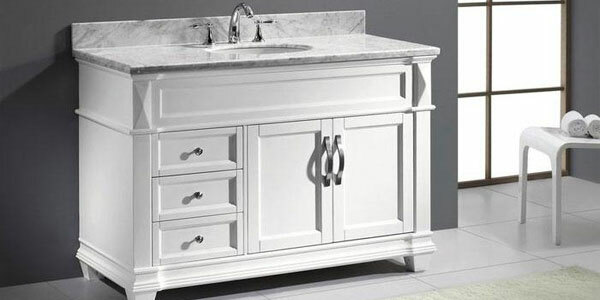 Bathroom vanities with classic Italian Carrara marble countertops and under-mount white porcelain sinks are popular in traditional homes, cottage style décor, and Victorian bathroom or Edwardian themes. The Kohler Tailored vanity collection, Damask, can fill your bathroom space with rich and ornate details. With premium hardwoods to the specially fabricated hardware and vanity tops, the Damask vanity exhibits the fine details found in traditional style décor. You can easily add custom storage and accessories to the Damask vanity to create the storage solution you need for your space. Every hair dryer, toothbrush and tube of lipstick has its own place. Your bathroom can be clutter-free, bringing peace between roommates, siblings, and couples. Customize your vanity with optional accessories. In-drawer storage makes organizing makeup a snap and built-in side-mount electrical outlets keep hair dryers and electric toothbrushes off the counter. 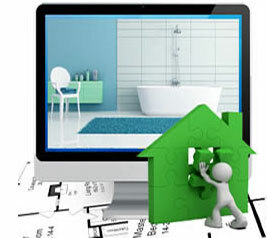 Kohler has their own version of online bathroom design software to help guide you in designing your bathroom space. The Virtu USA Victoria single sink white bathroom vanity is built to present a bold and an elegant look with spacious storage and a Carrara marble countertop. A Mission style bathroom vanity made by J & J International is perfect for a cottage style bathroom combining both elegance and warmth. With selections of various stone tops, pearl white finish and wood turn legs you can create a spa-like environment in any bathroom. The bathroom vanity cabinet includes two double-door cabinets with footed cabinet pulls, and two center functional drawers with matching satin nickel knobs and dove-tailed drawer joinery. Plus there's added storage space for baskets of bath towels and accessories on the open bottom plank shelf of this vanity cabinet. 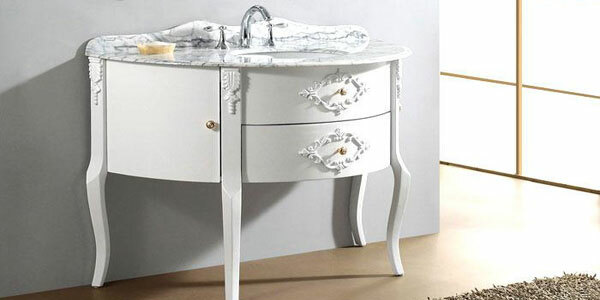 The Abigail vanity by Virtu USA features the curves, dainty legs and ornate accents reminiscent of another era. 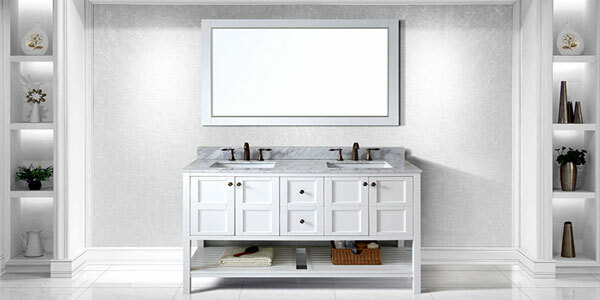 Virtu USA features a line of classic style luxury white bathroom vanities. These vanities introduce a quality of beauty and sophistication unmatched for a luxury master bathroom design. The Abigail white bathroom vanity features a Victorian design with gentle curves, delicate legs and decorative accents. This vanity will be a beautiful addition to a vintage loft or Victorian style home. Constructed from solid oak wood and finished in white, the doors and drawers are equipped with soft closing mechanisms. The hand carved mirror further enhances the design. The Abigail is a perfect choice for any bathroom design. The Colombo white vanity set is on the cutting edge of contemporary style bathrooms. 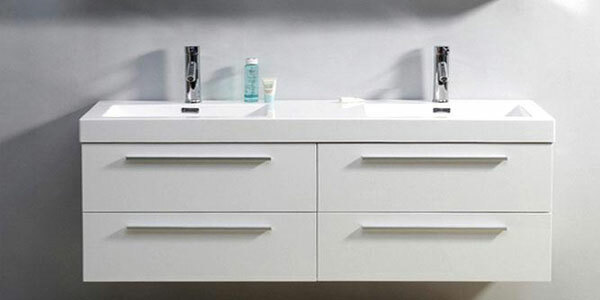 Virtu USA also carries a line of modern bathroom vanities featuring modern vessel basins on tempered glass countertops, including matching mirrors and quality faucets with a lifetime warranty. Their European contemporary design, the Bradford Collection, has an espresso finish that will ignite a touch of warmth to any modern bathroom upgrade.